Parliamentarians of Tibet's government-in-exile drink tea and talk during a break from a parliament session in the northern Indian town of Dharamshala, March 21, 2011. The Tibetan parliament-in-exile has formed a committee to determine how to transfer political power from the Dalai Lama to his eventual successor. 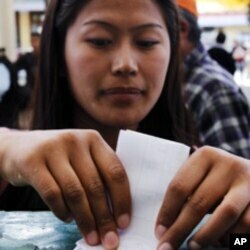 The move came after 83,000 exiled Tibetans across the world voted on March 20 to elect a new political leader. The Tibetan government-in-exile, based in Dharamsala, India, will announce the results of the election in April. The Dalai Lama has announced that he is resigning from politics to focus on spiritual matters. The 76-year-old Nobel peace laureate has called for reform of Tibet’s government-in-exile for decades, but says he will continue in his role as Tibet’s Buddhist spiritual leader. Losang Gyatso, chief of VOA’s Tibetan service, speaks with VOA’s Sarah Williams about this historic transition in Tibetan politics. "The Dalai Lama has started on a path of introducing a democratic system, let’s say from the early 1960’s, and that has taken shape in exile, based in Dharamsala in northern India, where a parliament was formed and where a cabinet was formed. But it wasn’t until the 2001 election for the prime minister in Tibet, and it’s called a “Kalon Tripa” where the people directly elected the prime minister. So, this particular time would be the third prime minister election in exile. And I think the Dalai Lama possibly he feels that it’s moving too slowly, and the idea of him actually devolving his authority maybe a solution to the Tibetan people taking greater responsibility in electing their leaders." These are sort of all the reasons why this is happening now. But how do you as a Tibetan feel about this election? "I personally feel that this is a good and very, very insightful and very powerful step that the Dalai Lama is taking. It’s very difficult for us Tibetans, there’s a very sizeable element of Tibetan population is probably quite traumatized by this. His statement of March 10 and his statement of March 14 to the Tibetan parliament in exile, if that were to be actually implemented, it means the Dalai Lama would no longer be the temporal leader of Tibet. This would be the first time in 350 years, there’s quite a bit of trauma associated with this for the Tibetan people. It’s a challenge to Tibetan exile electorate who are voting for leaders in exile. But it’s also a very huge challenge for Tibetans inside of Tibet. They have to start to negotiate this next phase of Tibetan leadership, so it’s a very interesting and difficult period, I must say." What is at stake in this election? "Well this election that occurred is for the prime minister of the Tibetan exiles who has the authority to choose a cabinet to run the various departments. This election was also for parliamentarians, there are 42 parliament members, also based in India. So, it’s like a double election and the importance of the parliament elections has been a little overshadowed by the interest and excitement about the prime minister’s election. To date, I would say, the quality of the Tibetan parliament has been spotty at best with people really paying more attention to local and sectarian issues, rather than Tibetan national interests, so I think this is another wake-up call, it’s the importance of the parliament, the lawmaking body of the Tibetan government-in-exile." What is the process for this election? Is it true the final results will not be known until next month? "Yes, I am personally puzzled also why it takes so long to announce. The elections [have taken place] throughout the world; most of the Tibetan electorate is in India, in local communities, settlements, villages and towns where Tibetans have settled in India, and also in Europe and North America and elsewhere. The process is relatively simple. I went to vote, you choose between the three candidates and also North America has two parliament members, so we chose from amongst five candidates. And then these elections are tallied, the results are tallied, sent to New York, which forwards it on to Dharamsala. So, I’m not sure why the counting process would take that long, but in prior times, and I’m not sure how it is now because of the Dalai Lama’s statement, but after the results are tallied, they are also presented to the Dalai Lama’s office for confirmation, and then announcements are made, so it’s going to take until April 27. What are some of the challenges that will be facing the new Tibetan leader? "Well the challenges are essentially challenges that Tibetans have been facing for the last 50 years. But I think there’s acuteness to the challenges because of the Dalai Lama’s desire to depart from the political scene, because of the Dalai Lama’s age, because of the intransigence of Beijing to make any meaningful progress in Tibet or in the dialogue process with the Dalai Lama. I think while the nature of the challenges remain the same, they’re becoming compounded with time.